The winning combination is to place the new technologies at the disposal of a Company’s know how. A know how which is the result of more than 50 years of experience and solid historical background. The art of iron working in Maniago goes back to 1380 and is documented by a paper in which the name of the first handcraft “Nicolossio” is written. However it seems that during the Roman Empire the extraction of iron from the mountain on the banks of the “Colvera” stream was already practiced. The official initiation of Maniago as “City of Cutlery” is based in late Medieval times when the talent of Maniago’s craftsmen won the attention of the “Venetian Republic” (an order for darts and swords was placed) and later on, the attention of the most important “Signorie” of Italy as the “Signoria De Medici” and “Estensi”. Maniago’s blades in fact were preferred rather than the blades of other Countries. So, simple elements like water, iron and wood were naturally transformed by the skill of the artisans giving birth to a tradition which has been developing and consolidating during the centuries. Definitely, technical developments have changed the production process; but for our products the ability and skill of the craftsman is still fundamental. Mercury hopes to be worthy heirs of that “knife gene” which has always been the distinct quality of Maniago’s knives. Planning is fundamental in obtaining a high quality and high performing product. The use of computing has highly qualified this stage but the prototype is still fundamental when taking the final decision. It’s at the prototype stage where the experience and skill pours out and it’s at this step when the actual production process is outlined. All the materials used to make Mercury’s knives are first quality materials. Different kinds of stainless steel (A420, A304, A430, A431, A440c…), carbon steel, titanium grade 5 and 2, aluminium light alloys, solid brass are used. The sporting knife handles are made with various kinds of wood (rosewood, olive wood, “cocobolo” wood, palm wood, boxwood, frostwood...) or real deer horn, cow or buffalo horn, aluminium or different kinds of plastic. For the kitchen and professional cutlery the choice of the handle material is limited by sanitary measures. There is still a very small demand for the natural wooden handle, but the most frequently used materials are “Frostwood” (compressed multi-layer wood impregnated with not toxic resins), moplen, pom. All the production process (as well as the management process) is ruled and constantly monitored by the “Quality management system control”. Because of that all the production steps are under strict control. Production of all the different components: each component (different kind of blades, springs, layers..) are made in a singular way and they have an average of 20/25 working steps each. Blades and springs are subjected also to the hardening process: this thermal process has the property to harden the martensitic steel giving it the stainless qualities. For instance, a multi-purpose penknife with 13 implements is made by 36 different components which have to be processed one by one before being assembled. Assembling: is the step where all the different parts of the knife are put together to obtain the final product. Finishing: it consists in the grinding, polishing and sharpening. 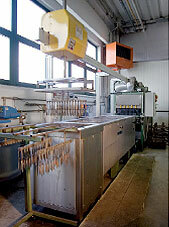 Cleaning and testing: the knives are washed to remove the residual working products. The blade is sharpened again by hand on the sharpening stone. Then the knife is cleaned and tested one by one verifying the correct sliding of all the implements. This production stage is strictly hand made by our qualified personnel. Packaging: after passing all the tests the knife is packed ready to be sold. Production of the blade: the first step is the production and finishing of the blade including the thermal processing of hardening according to the kind of steel used. 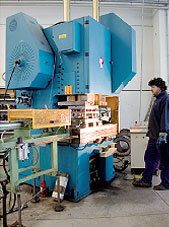 Production of the handle: The second step is the production of the handle and its assembling. Finishing: the process of grinding, polishing and sharpening gives the knife the final shape. Cleaning and Testing: at this point the knife is washed to take away all the processing residual materials. The blade is sharpened again by hand on the sharpening stone or by a leather wheel. Each knife is cleaned and tested one by one. Packaging: after the knife has passed all the tests it is usually fitted into a leather or cordura sheath and into a box ready to be sold. The production process for the kitchen and professional knives is not very different from the sporting knife one. Production of the blade: the first step is the production of the blade and its finishing including the thermal process of hardening adequate to the kind of stainless steel used. Also for this kind of knife a relevant importance and attention is given to the thermal process because as we said above, it is the stage when stainless and hardness is given to the steel. Production of the handle: the production and assembling of the handle is the second stage. In the professional cutlery, for sanitary reasons, the handle is made of non toxic plastic (like moplen) which is injected on the blade tang to make a solid body. Finishing: the grinding and polishing work (if required) and sharpening give the knife the final look. The first sharpening is made by hand on a grinding wheel and the second sharpening is made by a specific machine which adjusts the cutting angle of the edge at 15 degrees. Cleaning and testing: the knives are now washed to remove the residual working materials and a further hand sharpening on the sharpening stone is made. Each knife is tested one by one. Packaging: after the knives have passed all the tests they are packed and than ready to be sold.